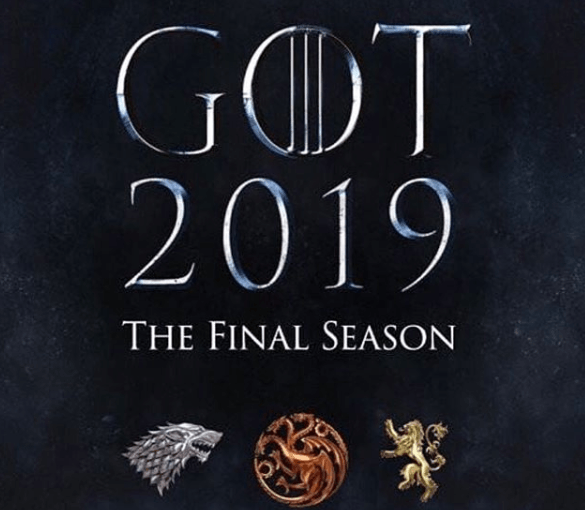 GOT fans are exciting about the eighth and final season of the successful drama fantasy television series which is coming soon in less than a year. Winter has come, and the white walkers are at the door, but while we wait, why don’t we reveal the most intriguing facts about the love life of our favorite characters? Yes, we know that the love story in the show is all twisted, but in real life, it is not bad at all. With that in mind, let’s take a look at the couples of our most beloved actors. Well, for the King in the North, love became a reality. As many of you can remember, Jon, portrayed by Kit Harington, fell in love with a fierce wildling woman called Ygritte, played by Rose Leslie, from the lands beyond the Great Wall. The romance surpassed the screen because the pair started a relationship in 2012. Even though it remained on and off for a while, they finally formalized their engagement through the Forthcoming Marriages section of The Times newspaper back in September 2017. They tied the knots on June, 23th, 2018 at Rayne Church in Aberdeenshire, Scotland. The reception took place in the medieval Wadhill Castle, which belongs to Rose’s family. Surprisingly, she comes from a noble Scottish family. 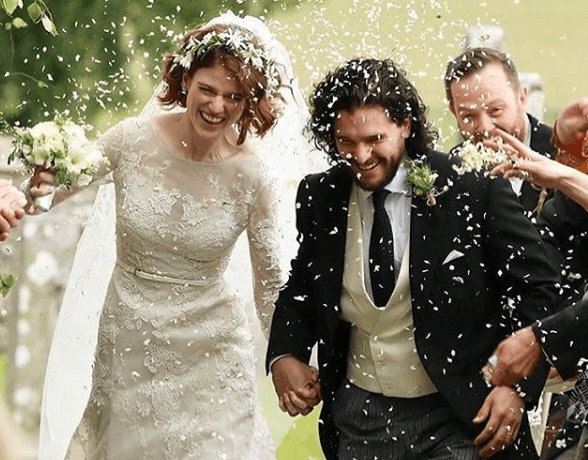 As everyone can expect, many of their co-stars attended the ceremony, and even though everyone expected something similar to what happened at the Red Wedding, everything went well. She has a lot of names: Daenerys Stormborn of the House Targaryen, First of Her Name, the Unburnt, Queen of the Andals and the First Men, Khaleesi of the Great Grass Sea, Breaker of Chains, and Mother of Dragons. But in real life, she is just simply known as Emilia Clarke. 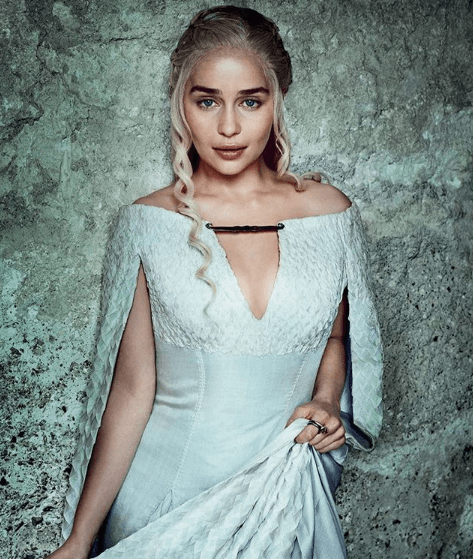 Described as the finest creation of George R. R. Martin in his books, the Mother of Dragon did not find love in the first seven seasons of the show, despite the fact that she had a lot of men lining up to worship her. Many could think that Emilia has better luck in love off screen but, although hard to believe, Emilia is still single. The gorgeous English actress has had a quite short love history, but it does not include Jon Snow nor Khal Drogo (Yes, we are sorry to disappoint you). 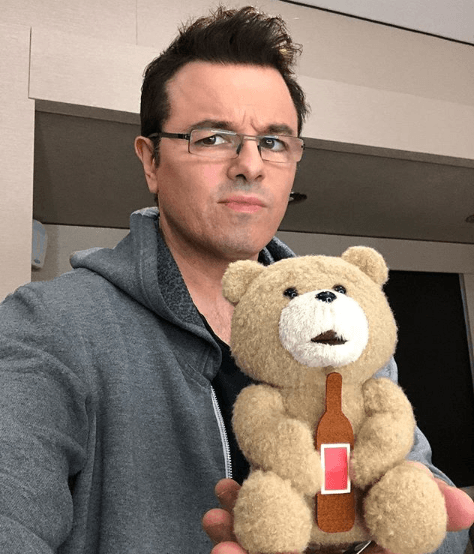 The only name that has been confirmed is Seth McFarlane, an American actor and filmmaker who has worked mainly in animation and comedy. However, the couple broke up within a year, and it was all because of GOT's shooting. Too much time apart brought the relationship to an end. Another name that we can add to the list is James Franco, whom she had a couple of dates, but it was nothing serious. Will she be able to find a father for her dragons? The evil member of House Lannister was married to nothing less than the ruler of the Seven Kingdoms, King Robert, in the show. But in reality, actress Lena Headey is engaged to director Dan Cadan. He is her childhood friend, and they also worked together on his short film The Devil's Wedding. The couple has already had an offspring together. On July, 10th, 2015, Lena gave birth to her second child, a daughter named Teddy. Now the actress and the director are allegedly planning to take the vows before the end of this year. Despite having a successful love life, Lena also has a record with some members of GOT’s cast. She was linked to Jerome Flynn, the actor who plays Bronn, the right hand of Prince Jamie. The actors dated 10 years before the beginning of the show. However, rumor has it that the relationship did not end on good terms in 2014. Despite being colleagues now, they do not talk to each other and cannot be in the same room together. Headey has a good friendship with Pedro Pascal, aka Oberyn Martell in the show. But many suggested that there could have been more than just a friendship since the pair was caught on camera shopping together, walking and hugging. Pedro once said in an interview that ‘anyone who comes in contact with her develops an instant crush’. 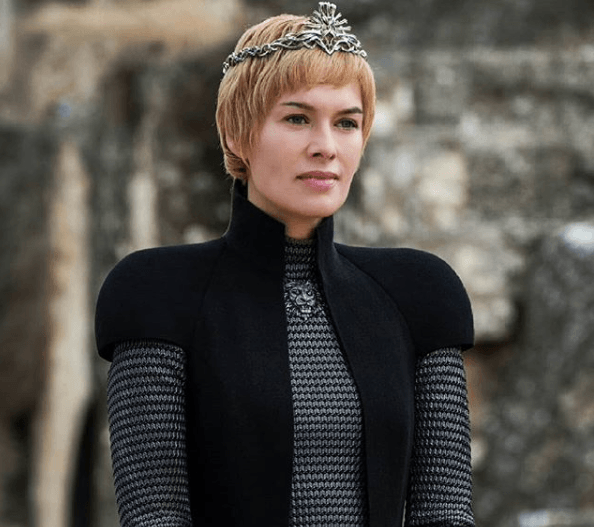 The golden-haired actor who plays Prince Jamie, Nikolaj Coster-Waldau, has had one of the most stable love lives compared to his peers in the show. 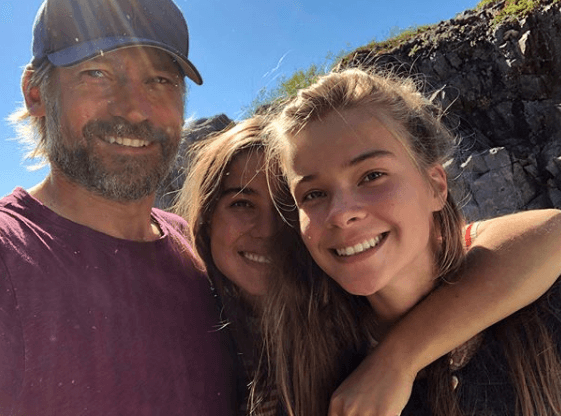 The Danish actor and producer married Nukaka, a Greenlandic actress, and singer, in 1998. The happily married couple has been together for twenty years, and the fruits of their love have been two daughters. They all live together in Kongens Lyngby, the commercial center of Copenhagen, Denmark, along with two dogs. 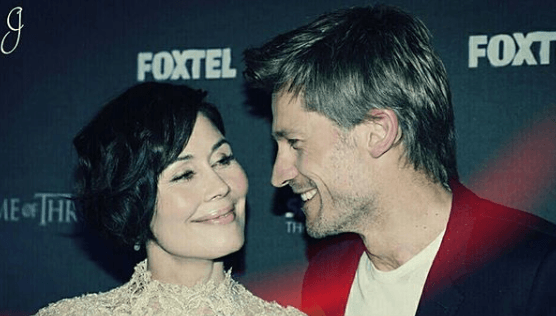 Apparently, Nikolaj is not much of a Casanova in real life. Although he is a complete womanizer in the show, the real romantic life of the actor behind the character is the contrary. 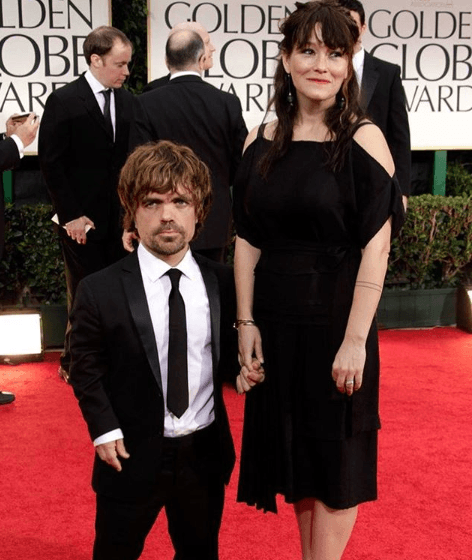 The American actor and film producer Peter Hyden Dinklage has been happily married to Erica Schmidt, a theater director, since 2015. The spouses have been very protective of the two children they have brought into the world. They had a daughter in 2011 and a second child in 2017. The name of the former has not been revealed publicly, and the genre of the latter is not known yet. The stunning redheaded Sophie Turner was the actress chosen to play the oldest of the Stark daughters. Her popularity increased not only for her role in the show but also when she started dating Joe Jonas. Considered by many the hottest couple in Hollywood, the pair shocked fans worldwide when they announced their engagement. The singer proposed to Sophie only a year after they started dating in November 2016, but they both claim to be madly in love. The stars haven’t announced an official wedding date, but everyone wishes them a happily ever after. They truly deserve it! Read More: The Way "Game of Thrones" Actors Should Look According To The Book. We bet Maisie Williams will be Sophie’s bridesmaid because the two young actresses have had a great friendship since they started sharing the set. 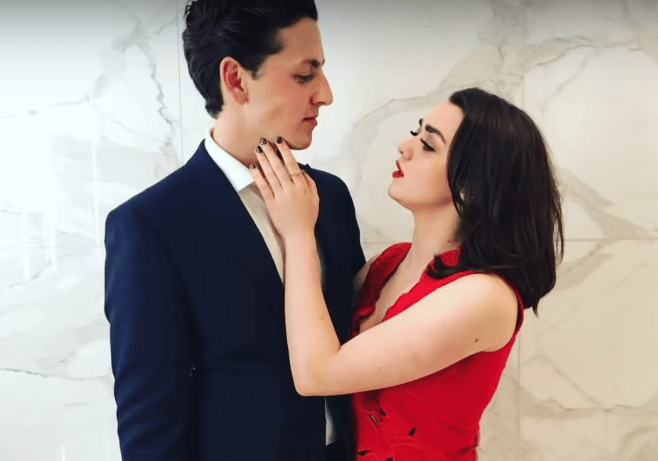 The 21-year old British actress has been dating a guy called Ollie Jackson for three years. Jackson is not famous, so little is known about him, but Maisie once revealed that they met at school. The new season of Games of Thrones promises to be hot, despite the fact that winter has come. We hope the tangled love stories in the show have a happy ending, but we extend the good wishes to the actors in real life too. Which is your favorite couple on the list? Share your thoughts with us! Game of Thrones Characters Real Age Ranking: From True Elders to Literal Kids. Actors Who Refused Game of Thrones Roles. 10 'Game Of Thrones' Theories That Could Change Everything We Believed In About The Saga. 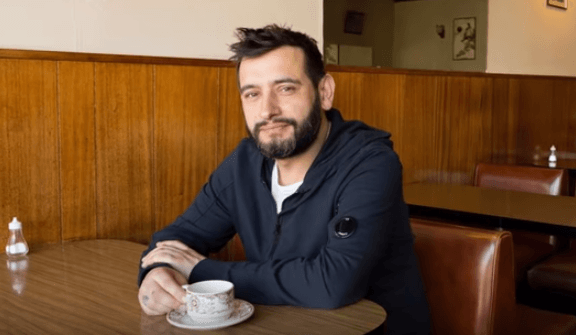 ved In About The Saga.